I began seeing pictures on social media of people holding signs that said things like "We stopped the bomb!" and "We Escaped" and a few that said "We Failed". A little bit of clicking on pictures and reading comments told me that there was a new trend in the entertainment business called "Escape Rooms". It looked fun, but all these pictures seemed to be of my friends that lived in other cities or were visiting other places, so I forgot about it. Until one night, a few months ago, when a friend texted asking if we wanted to do an escape room here in town. Sure! I'm always up for a good time. And the best part was the experience was being gifted to them, so we would get to try it out for free! But lets back up for just a minute. Some of you may be saying, "What is an escape room?" 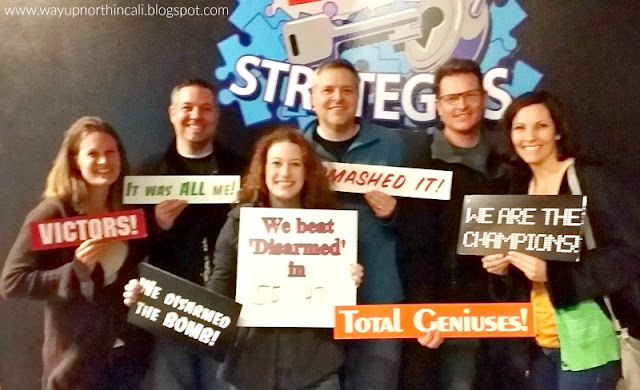 Oasis Fun Center states on their Exit Strategies website, "The latest entertainment phenomenon, live escape rooms, make their debut in Shasta County! An escape room is a themed environment where teams made up of 4-8 players attempt to solve mind-bending puzzles and conundrums to accomplish a specific assignment, all in a one-hour time frame." There were 6 of us. Three couples between the ages of...well let's just say we are fully fledged adults. We arrived at Oasis Fun Center. (Who knew they had an escape room? Not me. But they actually have two!) We were taken upstairs and placed in front of a door. We were offered a few key instructions about time, hints, and what our task was. Then we were told that most people fail. We were led into a room, the door shut behind us and the timer started. We had exactly 1 hour to find and deactivate a bomb. Anything and everything in the room could be a hint or clue. Some clues were obvious, some were subtle and some were riddles or puzzles. You guys, I'm a pretty smart person, but I've decided I'm no detective. I started looking for clues in obscure places. I found a couple, but most of the time, I just kept looking at things that were not clues at all. I messed around with one prop for a good 15 minutes, determined that I was supposed to find some meaning in it. I was wrong. But others in our group, looked in different places. My friend Shelli said one thing she loved about the experience was that she liked working together and seeing each others strengths. It literally took ALL of us finding and decoding clues to solve the puzzle. Our team mate Marci said she loved how the escape room involved a variety of different interests. There seemed to be something for every type of mind. We all had a great time! It was really fun to do something so different from our normal date night. Choose your team wisely. You're gonna need some smart friends! Mine are THE SMARTEST! Not interested in deactivating a bomb? You get to pick from 2 escape rooms. You can also prevent a terrorist attack! So, did we beat the clock? Did we disarm the bomb? We cut it close, but with less than 5 minutes to spare, YES, we Escaped! MENTION WayUpNorthInCali Blog and receive 20% off per person making it only $20 each! This is not a game for children. In fact Oasis reminds us that Exit Strategies was designed for adults. Anyone under 14 has to be accompanied by an adult. One last question. Just like in my blog posts about Mt. Shasta Ski Park season passes and Disneyland, I always try to answer: Is it worth the cost? Because let's be honest, $25 is a lot. And I'm not going alone, so now it's $50. Is it a $50 date? Yes, I think it is WORTH the cost. Do I always HAVE $50 to spend on date night? No. BUT never fear. Terry & Marilyn at Oasis Fun Center are offering North In Cali readers an EXCLUSIVE discount! If you mention that you saw this review on Way Up North In Cali blog, they will give you a 20% discount per person, making it only $20 each. And I almost always have $40 to spend on date night! Have you done an escape room before? Did you escape? 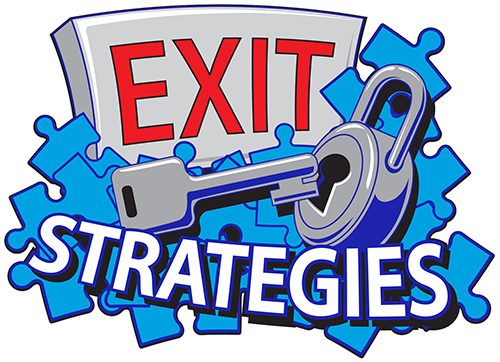 Have you tried Exit Strategies yet? Leave your comments below! And to make matters worse,live casino holdem most small businesses don't con side the importance of learning how to advertises, or how to engage outside help to be successful. This implies reliably advising yourself that you are only a transitory maker, and that your business should in the end supplant you from its everyday tasks.